Driving in Miami can be an incredibly frustrating experience. After all, our city is the two-time winner of the Rudest Drivers in America contest and, unfortunately, many of our residents are proud of that fact. We’re also known for bumper-to-bumper traffic and confusing roads that can bewilder a newcomer. Let’s try to untangle some of that together. Miami’s streets are divided into four quadrants: Northeast, Northwest, Southeast, and Southwest. The division between the North and South quadrants is Flagler Street and the division between the East and West quadrants is Miami Avenue. You can dissect a street address to help you figure out the cross-street. Simply remove the last two digits of the address and you’ll find out the corresponding cross-street. For example, consider the address 15416 SW 152nd Street. We know from the fact that it is a street that 152nd Street runs east-west. The first three digits of the house number, 154, tell us that the nearest north-south road is 154th Street. If you’re standing at the intersection of Flagler and Miami downtown, you’ll need to travel 152 blocks south and 154 blocks west to reach this address. Now that you know the rules, it’s also important to know that there are exceptions. Some streets, such as Brickell Avenue and US 1/South Dixie Highway don’t follow the grid. So, you’ll need to consult a map to be sure. Also, some municipalities within Miami-Dade County, such as Coral Gables, don’t follow the rules at all. Interstate 95 is a major highway running from Maine to Miami, where it terminates just south of downtown and feeds into US 1. 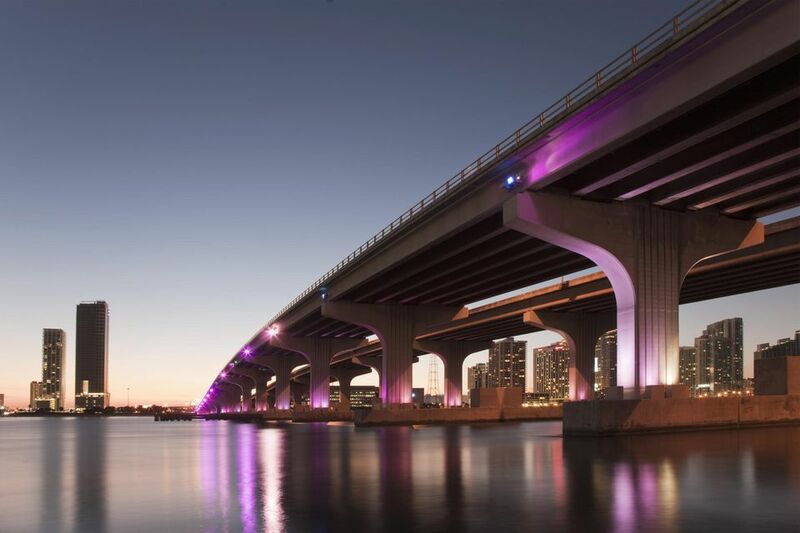 Locally, many people use I-95 to travel between Miami and Broward County, so you’ll find heavy traffic in both directions during commuting hours. Special 95 Express Lanes are available for those willing to pay a toll to shorten their commute. Airport Expressway (SR 112) runs from I-95 to Miami International Airport and is one of the more pleasant roads in our expressway system. It provides a direct route to the airport. There’s a $1.25 toll, but you can get a discount and breeze through the tollbooth with a SunPass. Palmetto Expressway (SR 826) runs from Kendall to North Miami Beach. I’m not going to pull any punches here: this road is horrible. You’ll find bumper-to-bumper traffic here almost any time that the sun is up and even after dark on many days. It’s a convenient route but slow as molasses. At least it’s free. Dolphin Expressway (SR 836) is another unpleasant road, running from downtown Miami past Miami International Airport to Sweetwater, connecting with the Homestead Extension of Florida’s Turnpike. There are tolls on this road and a SunPass is required to travel on the westernmost portion. Don Shula Expressway (SR 874) is a less-traveled expressway connecting the Palmetto (SR 826) to the Florida Turnpike Homestead Extension (SR 821). It carries a $1.25 toll. Snapper Creek Expressway (SR 878) is a short expressway connecting the Don Shula Expressway (SR 874) to US 1. There is no toll on this road. That’s a quick overview of driving in Miami. And don't forget that public transportation is always an option!